Pantelis Georgiou currently holds the position of Reader at Imperial College London within the Department of Electrical and Electronic Engineering. He is the head of the Bio-inspired Metabolic Technology Laboratory in the Centre for Bio-Inspired Technology; a multi-disciplinary group that invents, develops and demonstrates advanced micro-devices to meet global challenges in biomedical science and healthcare. His research includes ultra-low power micro-electronics, bio-inspired circuits and systems, lab-on-chip technology and application of micro-electronic technology to create novel medical devices. 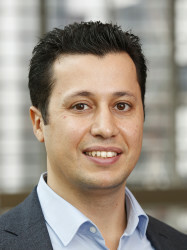 One of his key research focuses is on new technologies for treatment of diabetes such as the artificial pancreas but also develops novel lab-on-chip technology using CMOS with application in diagnostics for infection and control of antimicrobial resistance (AMR), in addition to wearable technologies for rehabilitation of chronic conditions such as osteoarthritis. Dr. Georgiou graduated with a 1st Class Honours MEng Degree in Electrical and Electronic Engineering in 2004 and Ph.D. degree in 2008 both from Imperial College London. He has conducted pioneering work in diabetes technology and is now leading the project forward for the development of the first bio-inspired artificial pancreas for treatment of Type I diabetes. In addition to this, he made significant contributions to the development of integrated chemical-sensing systems in CMOS. He has pioneered the development of the Ion-sensitive Field effect Transistor (ISFET), an integrated pH sensor which is currently being used in next generation DNA sequencing machines. In 2013 he was awarded the IET Mike Sergeant Achievement Medal for his outstanding contributions to engineering and development of the artificial pancreas. Dr Georgiou is a senior member of the IEEE and IET and serves on the BioCAS and Sensory Systems technical committees of the IEEE CAS Society. He is also the CAS representative on the IEEE sensors council and an associate editor in the IEEE TBioCAS and Sensors Journals. Within the IET he also serves on the awards and prizes committee.